The Flooring Design Group visited a family's home in Sugar Hill, Georgia to speak with them about refinishing their nearly 50 year old floors. 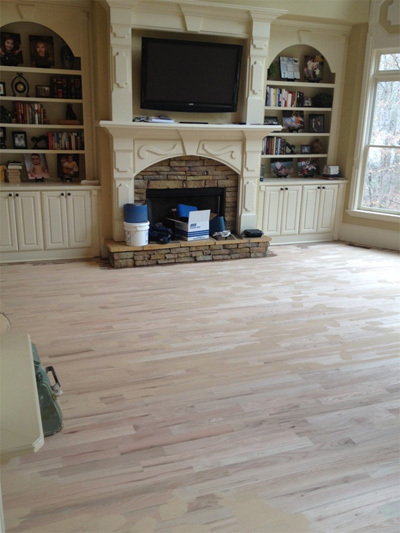 As this being something Simon and crew normally do, they had no problem talking to the homeowners about their ideas, and whether they should replace or refinish the current floors to make their home's aesthetic appeal more desirable. After only a little convincing, the family was convinced to go the cleaner, cheaper route of stripping, sanding and refinishing the existing floors. After just a short time on the job, Flooring Design Group already had moved all of the furniture, stripped the old floor and started to sand. What they were doing was a big job, but as usual, they kept their noses to the grindstone and worked their magic. The home had just recently been purchased and the new homeowners were excited to see the finished product and get completely settled in to what was sure to be a completely upgraded floor in their "new" older home. When the design experts from Flooring Design Group were finished, the Sugar Hill homeowners were elated at their new beautiful floors. Never had they thought that these floors could look this good. Aside from refinishing the floors, FSG completely cleaned so there were little to no remnants of work having been done. At Flooring Service Group we pride ourselves on our unique and exquisite design techniques and finishes. We believe our work is second to none and will stand behind any work we do. If you need hardwood flooring in Sugar Hill, GA, give us a call and let us provide you with the perfect solution for your home. Your satisfaction and confidence in our design are our main objectives.